Fans of the Battlefield games were elated when developer DICE announced that Battlefield 1 would be set during World War I, in the early 20th century. This was certainly a breath of fresh air after the prevalence of futuristic technologies in other military shooters like Call of Duty, and going back to the past was certainly a wise movie for DICE and publisher Electronic Arts. Although a sci-fi setting for Battlefield 1 was always unlikely taking into account that DICE is behind Star Wars Battlefront (a game set in many people’s favourite sci-fi universe), for which a sequel is coming in 2017. So it’s likely EA did not want a sci-fi setting for Battlefield 1, so that both games would not step on each other’s toes, and instead decided to set Battlefield 1 during the First World War. World War I is no doubt a great setting for a military shooter though, and one that’s hardly been explored in video games thus far. Although the early Call of Duty games were set during World War II (and were superb video games too), World War I was a different conflict altogether, one in which the lines did not move much and in which trench warfare was prevalent. 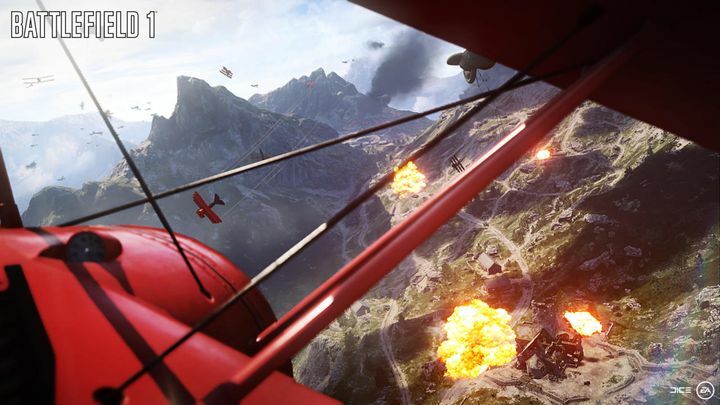 Battlefield 1 won’t just be about trench warfare, but will likely offer a bit of airborne action too. It’s unlikely that Battlefield 1 will only feature slow-paced shootouts in the trenches, which some gamers could find boring, but judging by the game’s announcement trailer, there might be plenty of exciting set pieces in DICE’s new game. After all, World War I was the conflict in which grenades, flamethrowers and chemical weapons were first deployed, and it looks like Battlefield 1 will also feature good old melee combat (a soldier is seen hitting another with a shovel in the trailer). And then there are the cavalry charges, with Bedouin soldiers going at each other with swords (some men began the conflict with old-fashioned swords before guns became widely available), the biplanes, and the giant zeppelins used to conquer the skies. Regarding planes, it is likely we’ll get a few cool airborne sequences in Battlefield 1 (this was the age of the infamous pilot known as the Red Baron after all), but there’s bound to be some heavy combat on the ground too, as the early tanks in use during World War I still packed a punch. Although taking into account that DICE is taking a risk with Battlefield 1’s setting, as people were expecting another sci-fi shooter like Call of Duty: Infinite Warfare, here’s hoping that Battlefield 1 turns out to be a great military shooter that makes the World War settings of past games popular again.